Alan Pardew has admitted Tom Huddlestone is the sort of player he would have loved to bring to Newcastle United last summer as he prepares the ground for an end-of-season rebuilding job. Huddlestone has been one of the signings of the season after joining Hull City from Tottenham Hotspur for £5m and will have a key role against the Magpies at the KC Stadium this afternoon. Although never a serious contender to sign him, manager Pardew has admitted the deep-lying playmaker – like his new team-mate Shane Long – is the sort of player he is interested in. With Pardew hopeful of spending serious money in the next transfer window, it points to the type of players he will look for. Pardew said: “Huddlestone was a player I really liked. Hull chairman Assem Allam has been a controversial figure as a result of his strident attempts to change the team’s name to Hull City Tigers, but Pardew can only look on in envy at the financial backing given to Steve Bruce (pictured below). While Newcastle have not made a permanent signing in the last two windows, Allam backed up the newly-promoted club’s summer outlay by sanctioning the January signings of Long and Nikita Jelavic. 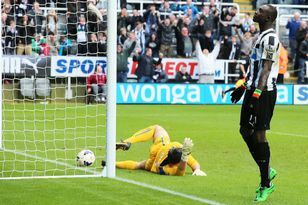 Pardew added: “You have to take your hat off to the chairman and the way he backed Steve with the two strikers. Newcastle announced a £9.9m profit this week. That, and the January sale of Yohan Cabaye for around £20m, ought to leave Pardew well placed for a summer of big spending. Strikers, wingers and midfielders will be on his shopping list after the inactivity of the last 12 months. Pardew will not wait until then to start planning. With his side secure in midtable, he will experiment in the coming months. He added: “I’ll certainly take the opportunity to look at one or two and sometimes the formations we play too.